Interior Design, the leading global brand that informs, connects and influences design professionals, announced the inductees for the 2017 Hall of Fame (HoF) Awards. 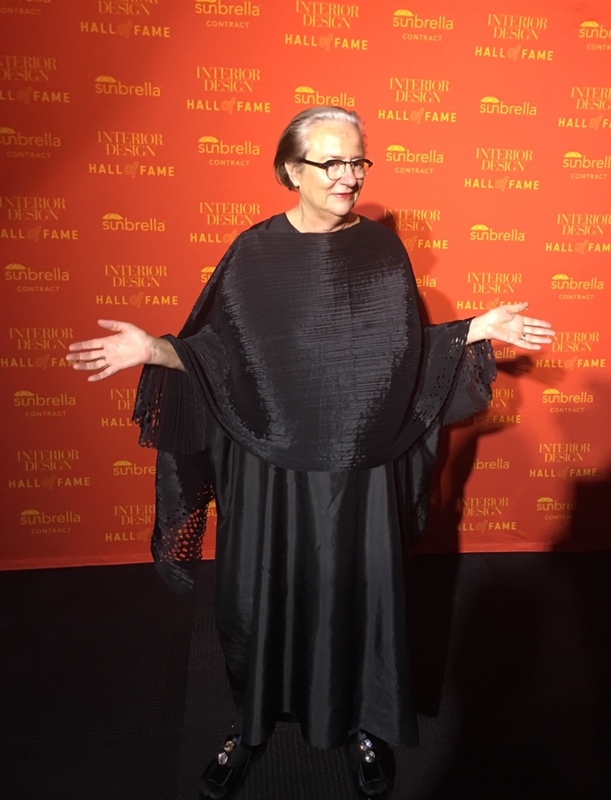 Selected by Interior Design Editor in Chief, Cindy Allen, and a nominating committee of previous HoF members, this year’s inductees included Lidewij Edelkoort, Trend Union (Influence); Peter Q. Bohlin, Bohlin Cywinski Jackson (Architecture); Mark Zeff, MARKZEFF (Design); and Robin Klehr Avia, Gensler (Leadership). The ceremony also included a special tribute to I.M. Pei in honor of his 100th birthday this year, in addition to hosting the prestigious event in a building of his design. Hosted by Allen and Interior Design Publisher, Carol Cisco, the highly anticipated event took place at the River Pavilion located in the I.M. Pei & Partners-designed Jacob K. Javits Convention Center. This 33rd annual HoF celebration marked the first time that the Awards were hosted at the River Pavilion. Previously, the ceremony was held in the Grand Ballroom at the Waldorf Astoria, however, due to a three-year renovation project, Interior Design sought out a fresh, new space. “The alchemy of finding a modern setting designed by a true icon on the occasion of his 100th anniversary was irresistible! We were thrilled to bring the Hall of Fame to this very special location, and to honor this wide-ranging group of architects, interior designers and industry luminaries whose talent, vision and dedication contribute to design’s impact everywhere,” said Allen. An unparalleled group of more than 1,200 industry leaders including designers, architects, manufacturers and design supporters were present to honor the 2017 inductees at the black-tie event. “This year, we’ve focused on the categories leading our sphere – workplace, hospitality, retail and residential – as well as our inductees’ collective design work, which enhances the lives of their clients as well as the world around us,” said Cisco. As in years past, proceeds from the event were donated to support the Council for Interior Design Accreditation, the Alpha Workshops, and Design Industries Foundation Fighting AIDS (DIFFA). Interior Design’s Hall of Fame, established in 1985, recognizes individuals who have made significant contributions to the design industry, in areas such as architecture, interior design, furniture design and product design. Previous inductees include such legendary figures as Albert Hadley, Frank Gehry, Clodagh, Antonio Citterio, Lauren Rottet, Robert A.M. Stern, David Rockwell, Philippe Starck and many more. Lidewij recently had a very interesting interview with Donatien Grau from AnOther Magazine. We would like to share it with you. Enjoy! "Lidewij Edelkoort is probably the world’s most famous trend-forecaster. Her work encompasses advising brands in fashion and the commercial world, such as Gucci, Estée Lauder, Lancôme or L’Oréal; teaching: between 1999 and 2008, she served as Dean of the Design Academy in Eindhoven, and now works on founding a new University in Poland; editing: she is the founder and editor of the magazines View in Colour and Bloom; and curating: she organised several shows, including "Skin Tight: the Sensibility of Flesh", at the Museum of Contemporary Art in Chicago. In 2003, she was named as one the 25 most influential people in fashion by Time Magazine. How would you connect fashion to elegance? Elegance is a talent, a sense, which you can see all the world over, in the most remote places. People without any sense of fashion, or even without clothes, can have it: African people have the most extraordinary sense of elegance. Their sense of styling is amazing. I believe that there is no necessary connection between the two. Then, of course, some designers use elegance as a tool, which cannot always be incarnated by those who wear it. Elegance is very rare. What is the role of history and art history in your conception of fashion? One needs to know the history of culture at large, which includes art history, but also costume history. It’s fundamental to have ideas about textiles in order to be able to understand the flux of volumes. It enables you to decipher how it can be different from the past, this time. It’s a requirement. Would you describe fashion as a language and a discourse, as Barthes did it? It’s definitely a language. It’s a way we talk to ourselves and to others. It’s sometimes magnified by the masses, sometimes very sober and intimate. Once you are able to read the language of fashion, it helps you very much to understand society. For me, the language of fashion is the best possible tool to do forecasting. Textile, materials and cars are there first: they always indicate major changes. If you can read those things, then you can understand the rest of the world. It’s a very powerful tool. It modifies the body, behaviour, it modifies written language. It’s a very powerful script. It’s a bit different now, because there is so much economical concern. However, in the 70s, 80s, 90s, it was a highly powerful tool to understand what was going on. I still use it very often. The word "intellectual" was coined in a time of great political distress. Does fashion have a political role? And in which way? It might. It should. It would, if politics mattered. The current disapproval of what politics are makes it pretty difficult to discuss. What we discuss today is the need for another political engagement and another political possibility. We need first to admit the end of this era, and start reflecting about the new one. Fashion could do that. It does it in the sense that it reflects on what is regional. I believe that the regional is going to be a major influence in coming politics. How would you relate the concept of "fashion" to the one of "style"? Ideally, they go together. But often they’re very far apart. Fashion doesn’t seem to be able to be itself so much in the current time. It doesn’t seem to be self-reliant. It needs people, scenes, red carpets... Fashion before was it, itself. Styling becomes a scaffolding of fashion. It’s a cache-misère, it’s making things much more interesting than they really are. That’s why styling has such a major impact on society: styling of food, of photos, lifestyle... Some people are really talented, and almost artists, but sometimes it is just trying to hide a lack of ideas. What does fashion have to do with intellectuality? It is purely intellectual. It has all the assets of an intellectual discourse: it’s a thought-process, it’s trying to breach the two brain-halves, you need to have your history, you need to be able to debate about what you’re doing, as with any other artistic discipline. The whole thing is that fashion is something very serious. It’s an enormous industry, of course, especially in Europe, where we have the luxury brands, but it also concerns everybody. It cures people, actually. It’s a big responsibility. Your activity as a trend-forecaster encompasses fashion, of course, but also advertisement in other fields, and you’ve also accomplished editorial work and curating. What is the specificity of fashion inside of culture? Because fashion uses textiles, it has a softer side which many other disciplines don’t have. Textile is so important in itself because it is a creative domain. A little piece of fabric enables you to understand the time we live in: fashion, because of its textile component, has that double power. 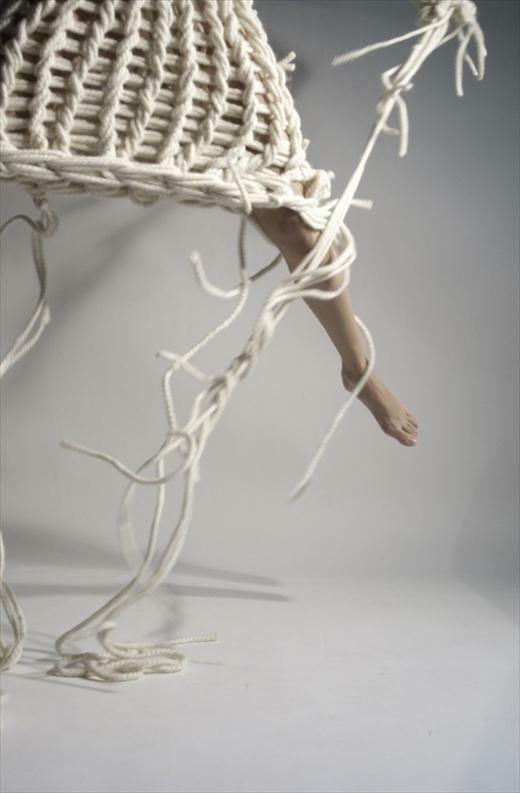 First the textile needs to be created, and then after comes the form, the volume. I understood it one day, when we went from the 80s to the 90s. In the 80s, the dominant textile was the diagonal, the gabardine. It is a façade fabric that is able to hide what is inside. So you can use a viscose that looks like a wool, and then you see that it’s not wool. It was exactly correlating to the façade architecture of postmodernism and the façade workings of the companies at that time, when we went overboard in the 80s. In the 90s, there was an ecological and economic crisis. From one day to the other, we went to square weave. Politicians wanted to look honest, and this is an honest weave, in which you can’t hide anything. When you have this square weave, you can embroider it, use it as a canvas. The message was clear; you had to be square. I understood that if you go back to history, you can understand the time period from knowing the dominant fabric. Like when velvet becomes important: velvet is a double, schizophrenic fabric. It’s very artistic and very solid. All the fabrics have a quality, which is like a character. Fashion is casually using these elements of development. Forecasting trends is a form of action towards culture. Don’t you think that by forecasting trends, you actually shape them? I wish I would. You do shape them a bit. It’s like a very small radar which sets into motion several other radars in the industry. I set things in motion, if you want. And I give my clients the possibility to understand what they’re doing, the time we’re living in, and why they’re actually doing it. But the other radars are the market, history, marketing, the creative groups of people working there, and they all have their own assets. In fact, there is an impact, but it is relative. If you want to listen, you can."